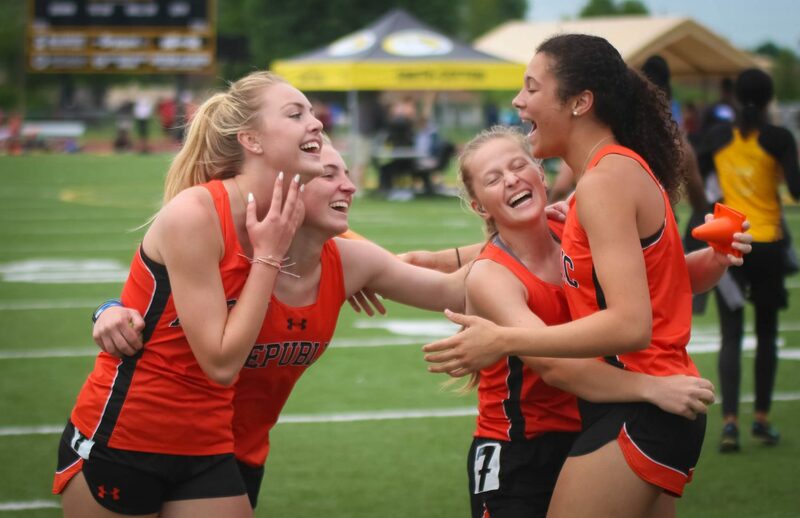 Republic advanced to state in six events Saturday. (See photo gallery below.) Skyler Owen qualified in three events, and Avy Powell-Qualo qualified in two. Avy Powell-Qualo finished second in the high jump. Skyler Owen finished fourth in the 100-meter dash. The boys 4×100-meter relay team of Chase Liedtke, Dylan Brown, Jake Jones, and Skyler Owen finished fourth and broke a school record with a time of 43.44. The girls 4×100-meter relay team of Delaney Smith, Kaitlyn Ragsdale, Lauren O’Hara, and Avy Powell-Qualo finished fourth. Jasmyn Douglas finished second in the 400-meter dash. Skyler Owen finished third in the 200-meter dash to qualify in his third event. Reese Wakins did not qualify for state in pole vault (finishing fifth), but cleared a personal best 9’6″. Here’s the photo gallery from the Tigers’ and Lady Tigers’ day. See the full album and order prints here.